A penguin that was once known with the name of Orda, now is a cold assassin. 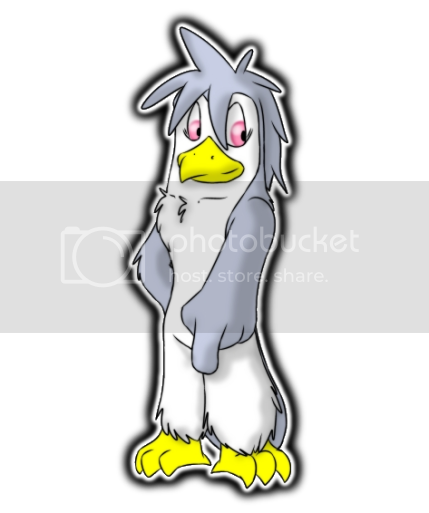 Back then, he was the leader of the Nuzina Clan, formed by a special breed of smart penguins in the ILUMINIA AQUARIUM. He was loved and respected, he had a wife called Layna and a lot of friends like Hirnon and Garros. But then... something happened. Something that forced him to become a mercenary without law respect, searching for vengeance against who ruined his life forever. As he know for now, he's the only survivor of his clan. The most beautiful female of the Nuzina Clan, and Orda's wife. Despite of her appearance, she's very strong and willing, probably more than most males of the pack. She's surely more willing than her husband, and loves being helpful as the leader's partner. She can also be romantic and sweet if the situation requires it, but for the most of time she prefer to show her warrior soul. She truly loves Orda, even when he act lazy and carlessly, and she recently gave him an egg.